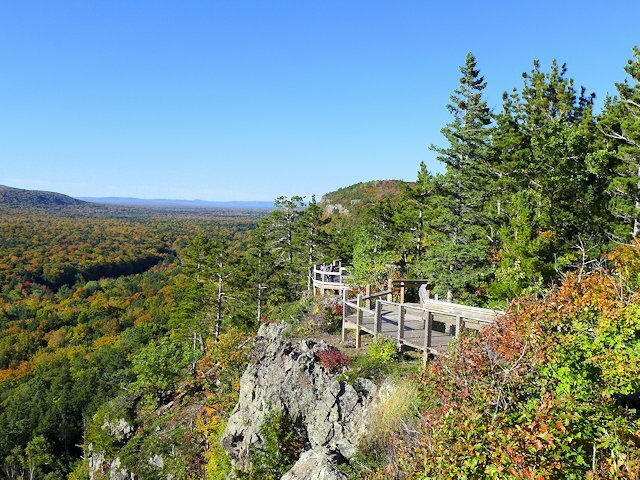 View from a Scenic Lookout at Porcupine Mountains State Park in Michigan’s Upper Peninsula. From the Porkies, take Hwy 64 to Ontonagon. There you have two choices of route. Hwy 38 goes directly to Greenland. The Highway 45 alternative is for history buffs. It goes through Rockland. From Rockland, take Victoria Dam Road 4 miles to the Old Victoria Restoration Site, a restored pioneer mining homestead that is an interesting tour. Then return to Rockland and continue until intersecting with highway 26 heading north to the Keweenaw Peninsula and Copper Harbor. Depending on route choice, it is 30 – 40 miles to Greenland; add an extra 90 minutes if you do the Old Victoria side trip. It’s about 35 – 40 miles to Houghton-Hancock, twin cities that are on either side of the Portage River that defines the Keweenaw Peninsula. These are old mining towns with lots of character and home to Michigan Tech University and Finlandia U. Downtown Houghton’s main street has been re-furbished and offers some decent brew pubs and restaurants. There’s a nice waterfront hiking/walking trail along the Portage River and we like their RV Park that has great views of the river and is fully paved. If you are attracted to mining history, plan to add some time to your itinerary to explore the museums and exhibits in these two towns and Calumet-Laurium ten miles down the road. One museum of interest to rock hounds would be the Seaman Mineral Museum at the Michigan Technological University in Houghton. North of Calumet, Hwy 26 and 41 run together for another 14 miles. There they divide, Hwy 26 running along the coast and Hwy 41 going down the center of peninsula. The latter is shorter route to Copper Harbor, and while not along the lake, is fairly scenic. Hwy 26 goes through the communities of Eagle River and Eagle Harbor, former fishing villages, now resort towns. 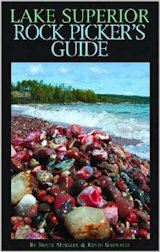 Look for the Jampot, between Eagle River and Eagle Harbor – a *Must See* stop. In about 15 miles, you’ll have to choose between taking Brockway Mountain Drive or continuing along the lake shore. Both routes are scenic; we recommend the Mountain Drive for the spectacular view at the top. You reach Copper Harbor in about 12 miles. The total time from Greenland, Michigan to Copper Harbor is about 2 hours, unless you elect some side trips or extended stops. Copper Harbor began as a mining settlement in the 1840s. The value of the huge copper deposits that were discovered there gave rise to the construction of Fort Wilkins in 1844 to provide some law and order oversight (of the miners and of the ore asset). The natural harbor soon became an important port for shipping copper out and supplies in. The present lighthouse was built in 1867. There is a combined excursion boat tour of the harbor and a narrated tour of the Lighthouse Museum that looks interesting, but we didn’t want to leave Hans locked up in the truck for the length of time the tour required. Plan to spend at least a day in the Copper Harbor area, plenty to see and do if you spend two days. 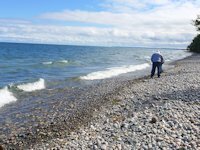 On your return trip, if you have time, head to Lac La Belle via Route 41, and take the scenic shoreline drive that runs on the eastern side of the peninsula to the community of Gay. From there you go to Lake Linden and skirt the edge of Portage Lake on your return to Hancock. Walking the beaches and hiking trails along the harbor. Major trails exist on the western and eastern ends. Hiking the nature trails in the Estivant Pines sanctuary with many magnificent specimens of old growth white pine. Sprinkled among the pines are some pretty impressive sized maples, oaks, and birches. Fort Wilkens State Park: touring the restored fort, enjoying the full service campground, including hiking trails along both Lake Fanny Hooe and Lake Superior. Brockway Mountain Highway and Lookout. The 9 ½ mile drive from Eagle Harbor to Copper Harbor is reputed to be the highest above-sea-level highway between the Rockies and the Alleghenies. Touring the artisan and gift shops in town. Going to The Jampot, a bakery and conservery operated by the Monks of the Holy Transfiguration Skete. “They are truly monks when they live by the labor of their own hands.” (Holy Rule, Chapter 48) Located south of Eagle Harbor, Michigan about 12 miles from Copper Harbor.